So as you all know, I am expecting a little girl in about six weeks. 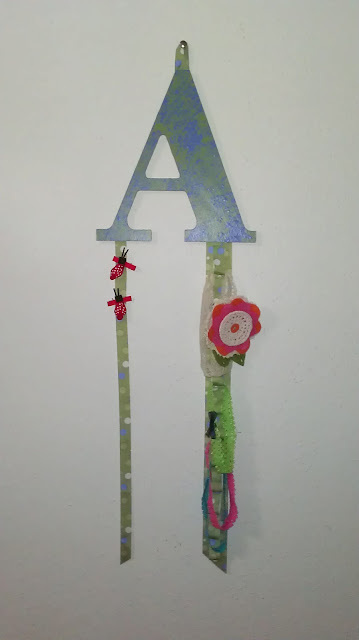 :) Hubby and I are getting super excited to meet her, and, as we are both crafty people, we have both been making things to prepare for her arrival. I finally got all of the "big stuff" done (sheets, quilt, curtains...) and have moved on to some smaller projects like this one. 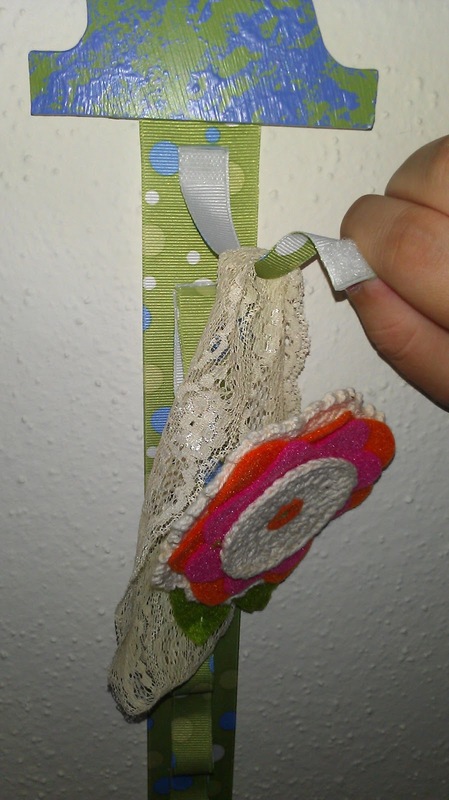 I have seen many bow holders using this basic concept--an initial or plaque with ribbons hanging down from which to clip bows. What I had not seen was one that could also hold headbands. My little girl has already got a collection of headbands, and I wanted to be able to hang these from the same bow holder--you know, to keep all her little hair accessories in one place--so I came up with this design. It's simple and involves no sewing (which is a rarity for me, lately). To get started, you'll need an initial (or plaque), ribbon (I used two different widths: 5/8" and 1 1/2"), acrylic paint, paintbrush, Velcro, and a good craft glue (I used E-6000). 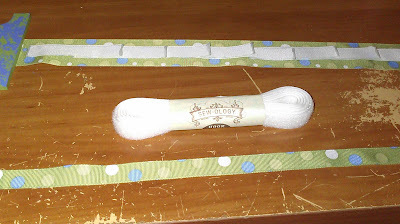 You will also want something to keep your ribbon from fraying, such as clear fingernail polish. Paint the initial your desired color. 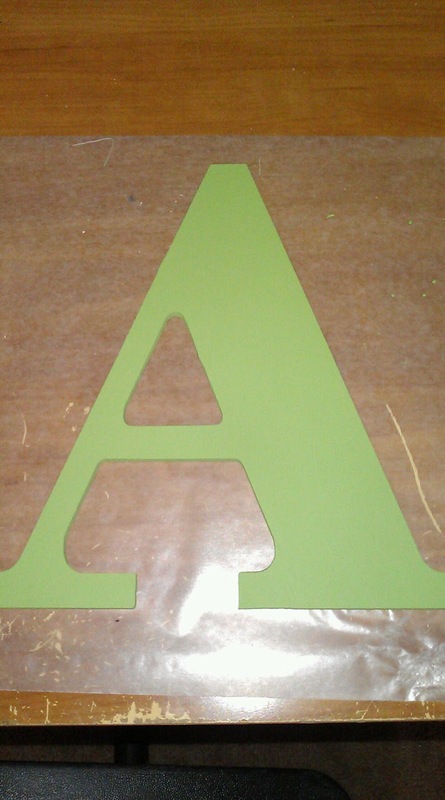 My baby's nursery is sage green, so I went with that for my base color. This was too plain for my taste, so I decided to jazz it up using a really simple but cute technique. I wadded up a paper towel and dabbed it in my second color, then dabbed away on top of my base coat of paint. 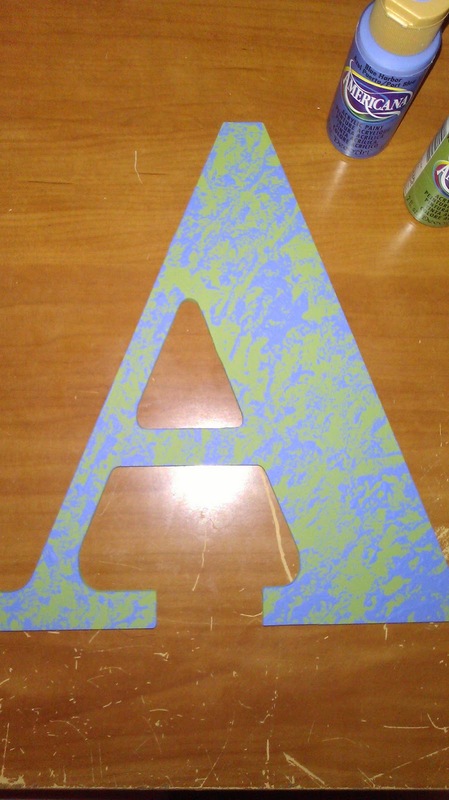 Super simple, but look at what a cute finish it gives. 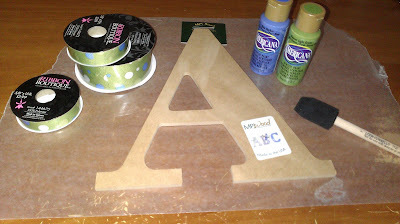 After this dried, I also put a coat of Mod Podge over the whole thing because I thought my paint was too flat. 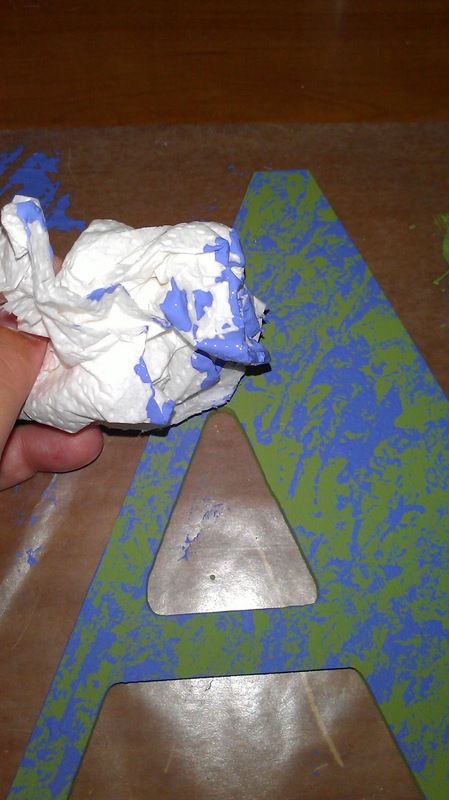 If you use a glossy paint or prefer flat paint, you can skip this step. Next, you will need to cut your ribbon. From the 1 1/2" wide ribbon, cut one piece 21" long. 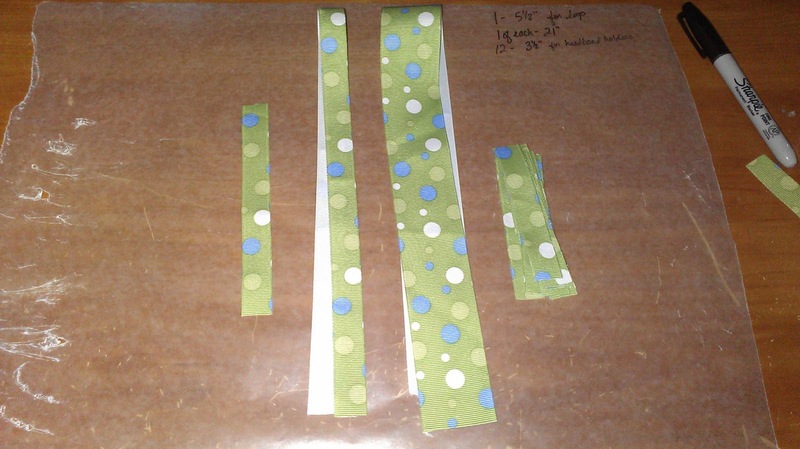 From the 5/8" wide ribbon, cut one piece 21" long, one piece 5" long, and 12 pieces 3 1/2" long. On each of the 21" long pieces, cut one end at a 45 degree angle. It looks best if these angles mirror each other--meaning that the shorter sides are both toward the middle. Using clear fingernail polish or some other clear finish (I actually used Mod Podge for this step as I was out of clear nail polish), paint the ends of all your cut ribbons. Just run a thin amount on each end and let it dry. 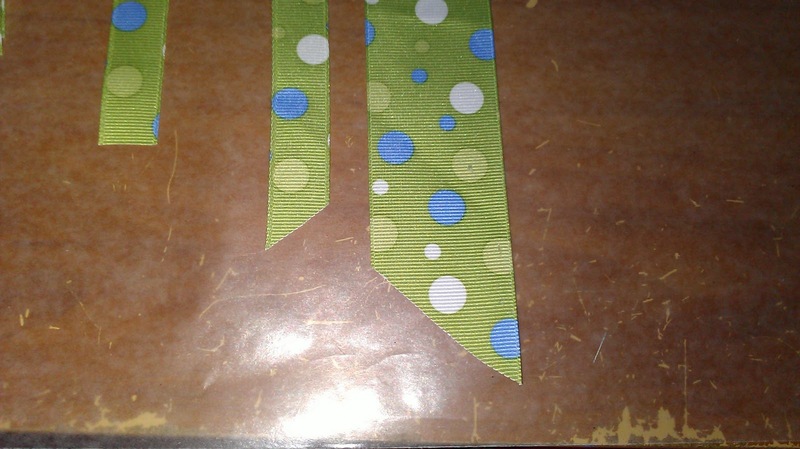 Do this for each end of each ribbon piece you cut. This will keep your ribbons from getting ravely and scraggly. When the ribbons are dry, flip the initial over. 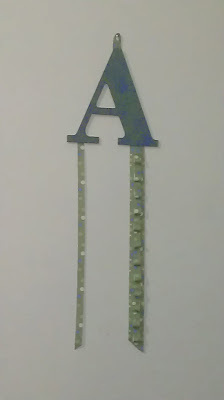 Take the 5" piece of ribbon and glue it to the top of the initial on the back, forming a hanging loop. 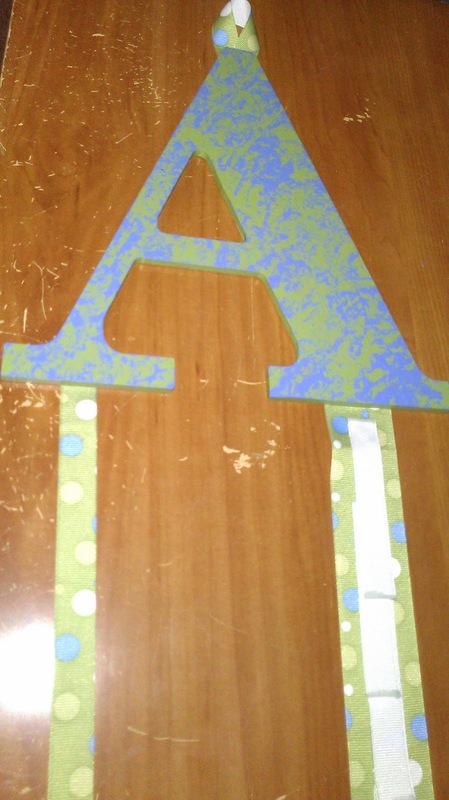 Glue the non-angled ends of the 21" long ribbons to the bottom of the initial on the back. 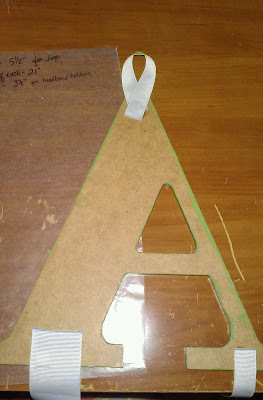 I put the wide ribbon on the wide side of the initial. Let dry. When the ribbons are all nice and dry, flip the initial back over. 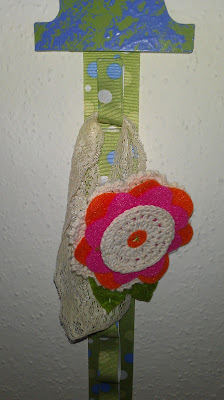 If you want just a bow holder without the capability of holding headbands, you are done at this point. If you want a headband holder, keep following along! 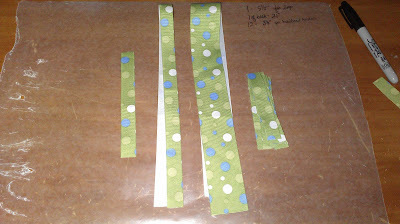 Take the 3 1/2" pieces and lay them out upside-down in the center of the wide ribbon. I started at the top and worked my way down the ribbon, laying each new piece roughly 1 1/4" inches below and underneath the one before it. This sounds more confusing than it is; just make sure they are pretty evenly spaced before you start gluing them down, and remember that they will overlap. When you have your spacing figured out, glue just the top end of the narrow ribbon to the wide ribbon. Yes, you want to glue it upside-down. 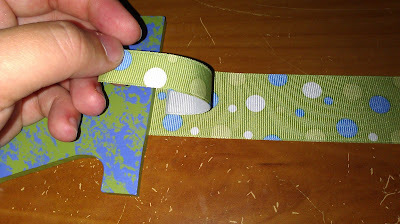 Keeping the first little piece back and out of the way, glue down the top of the next ribbon. 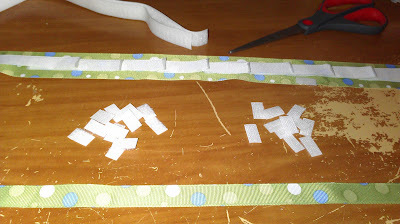 Keep going until you have all 12 ribbon pieces overlapping and glued on. At this point, they will hang off the end of the wide ribbon a little. Here's what the whole thing looks like so far. 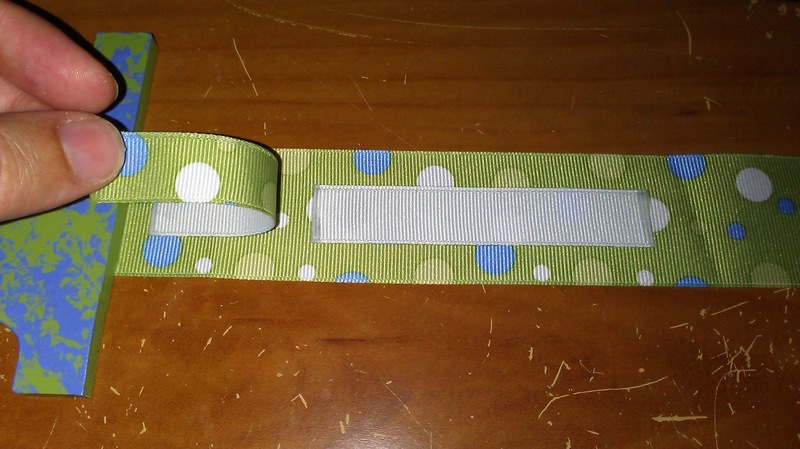 Once those little pieces of ribbon are nice and dry, you're going to attach some Velcro to them to make little loops to hang headbands from. 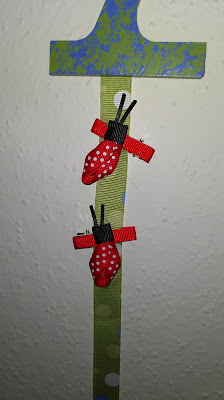 I used sew-on Velcro for two reasons. One, my first intent was to sew it on, but then I decided that would be a pain with all of the little pieces. 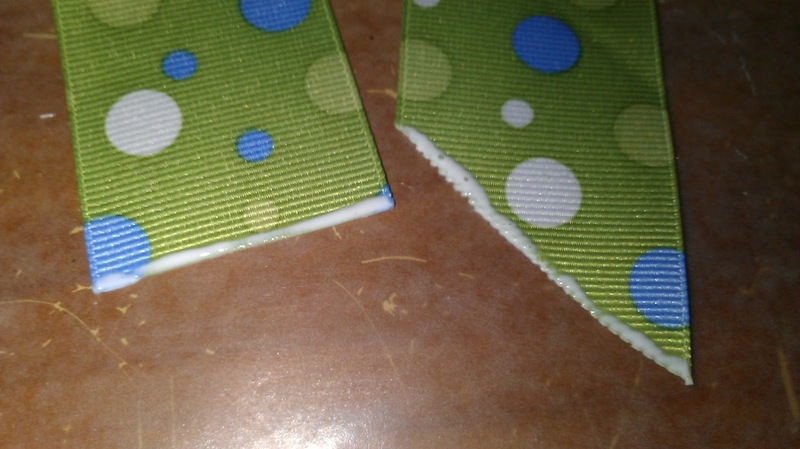 Two, while sticky-back Velcro would work, I would have had to cut the pieces smaller, and I hate what that adhesive does to my scissors. It's pretty impossible to get off, and the scissors are never the same again. If you want to, however, you can easily use adhesive Velcro. Cut 12 pieces each of the hook side and the loop side of the Velcro. Make sure they are no wider than your narrow ribbon. Glue a hook side to the top and a loop side to the bottom of each short piece of ribbon, forming little closeable loops. Note: I feel I should mention the importance of making sure the loop side (aka the soft side) of the Velcro is attached to the bottom (the free end) of the ribbons. The reason for this is that this is the end you will be feeding through the headbands to hang them up, and the loop side will not catch on any delicate lace or elastic and ruin it, while the hook side (aka scratchy side) might. Once your glue dries, you are finished! Hang it on the wall and get ready to display the cuteness of baby hair accessories! 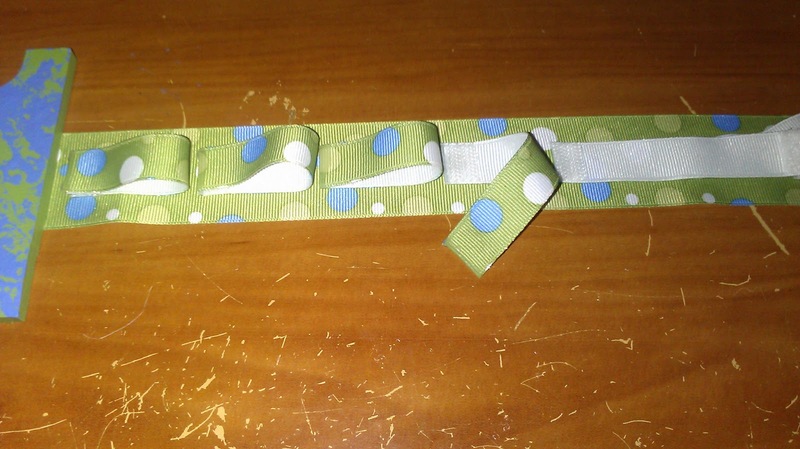 Clip barrettes and bows on the narrow side. There you have it! A way to display and organize all those precious hair accessories! Great idea for the headband side! 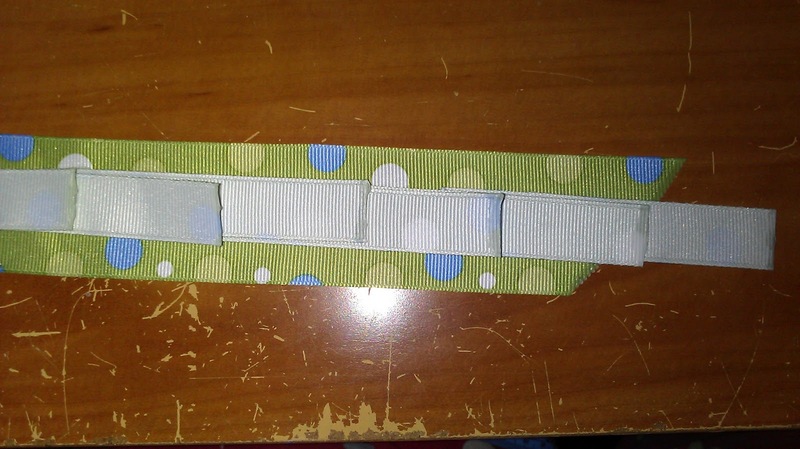 I had seen the barrette side done before, but that is pure *genius* to make the little velcro loops. This is why I love you.